The inclusion of the option of a flexible bottom rail for your high speed roll door can enhance the performance and safety of your investment. 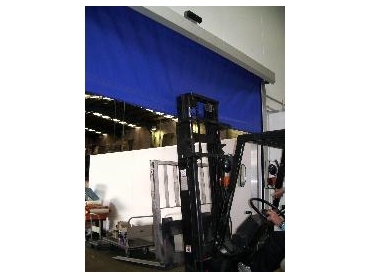 DMF International can provide this as an option for their popular series RL3000 rapid auto roll door. The flexible bottom rail, allows the bottom blade to flex in the horizontal and the vertical planes, and, to DMF, can include a pressure sensitive auto reverse feature. Firstly, this type of rail provides safe bottom rail on the market, with no chance of injury to operators. A rigid bottom rail, even with the safety reverse sensors, can still injure a pedestrian under some circumstances, and there have been cases of hospitalisation required as a result of a severe impact. However, with the flexible bottom rail, this chance is completely eliminated, since the bottom rail is soft, and will flex over the pedestrian. Another added bonus is that because of the horizontal plane flex, the bottom rail can resist damage caused by impact from a forklift. This can save a great deal of cost in downtime and repairs.